Blogs, white papers, videos, podcasts or reports: government decision-makers turn to thought-leading sources like these to inform their buying decisions, learn about new technologies and learn about vendors. But which tools are most useful and influential, what content do they hope to see and where are they going to find it? Market Connections polled government decision-makers around the country to answer these questions with the 2019 Content Marketing PulsePoll™. 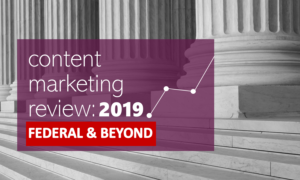 Join Market Connections as we present the results of the 2019 Content Marketing Review: Federal & Beyond. The event program will feature a review of key findings followed by a panel of public sector marketing professionals discussing and debating the results. What are best practices for reaching the STATE & LOCAL government audience? Do emerging and/or complex technologies require different content marketing strategies? What spurs action and what prompts them to share your content with their colleagues? Aaron Heffron, President, Market Connections, Inc.